George Romero’s zombie movies have always been about strength in creepy numbers, so let’s consider a few: It’s been more than four decades since Romero made his original genre classic, 1968’s “Night of the Living Dead.’’ The filmmaker’s latest, “Survival of the Dead,’’ is the sixth entry in the series, and the third Romero has made since relaunching the franchise in 2005 after a 20-year hiatus. That’s a lot of chomped flesh. Which raises the question: Does the series have anything left? Any fresh chills or gory, pointed metaphors to deliver? Or does it just continue to lumber on as lifelessly as the zombies themselves? There was validity to 2008’s “Diary of the Dead,’’ a cool-kids-with-a-digicam exercise in which Romero strove to show the franchise’s relevance in the YouTube age. (“Diary’’ and the stylistically similar “Cloverfield’’ hit multiplexes almost simultaneously.) “Survival’’ swaps that timeliness for themes and nods that are perhaps meant to seem enduring, but that instead feel arbitrary and out of touch. 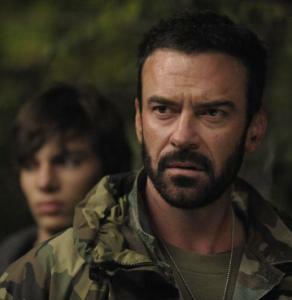 Romero ties the new movie to the last installment by bringing back bit player Alan Van Sprang’s soldier-turned-looter, this time summoning him front and center for his own ordeal. Van Sprang’s Sarge heads up a four-person outfit that’s still roving, plundering, and gunning down the undead, until the group catches an Internet call to join a zombie-free island enclave just off the Delaware shoreline. The fine print: The place has just witnessed an ugly family feud led by crusty Patrick O’Flynn (Kenneth Welsh), who’d been exterminating infected islanders, and nemesis Seamus Muldoon (Richard Fitzpatrick), whose talk of a cure was mostly just to spite O’Flynn. It was the exiled O’Flynn who posted the dubious online invite; when he joins the soldiers in ferrying to the island, it’s obvious they’re about to be welcomed with severed arms. The movie boasts some novel elements, including a zombie equestrienne (Kathleen Munroe), and a zombie twin whose sibling hasn’t been infected. There’s also an aquatic attack sequence that lends some tension that’s desperately needed, given the number of scenes in which soldiers just roll their eyes and casually blow zombies away. But Romero’s Hatfields-and-McCoys setup feels more random than creative, and the idea that they’re all Irish — or cowboys! — is more desultory still. Part of what’s always been intriguing about the series is the discussion it inspires, be it about the anti-racism subversiveness of the original or the blunt consumerism statement of “Dawn of the Dead.’’ (Yes, we do get it — for fans, “Survival’s’’ image of a zombie’s eyes being popped out by a burst of firefighting foam is likely worth a thousand deep thoughts.) But if Romero is in fact after anything topical here, it’s unclear. An indictment of congressional partisanship? Reviving some dated euthanasia debate? Romero reportedly has plans for more films branching off of “Diary.’’ You’d like to think that he’s still getting a chance to make them because he continues to have something sharp to say, and not just because “Zombieland’’ did killer business. We run down the best films featuring the living dead. Discuss What are your favorite zombie movies?